Jeff Nicholson is available by the hour, the project, and as a member of a Freely Creative Team. There are a few sticker development and design packages available here. For all other identity development, naming and brainstorming projects contact Jeff for availability, discussing your needs and value pricing. For naming and brainstorming projects Jeff prefers to take on only one project at a time (so he can live the muse at all times and with the availability of other creative business owners, entrepreneurs, designers and resources). Contact to discuss if we are a good fit in helping launch ideas that fly and marketing that sticks. 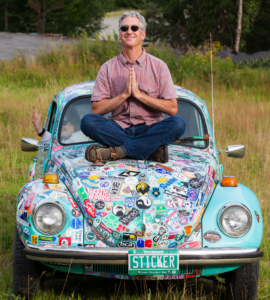 Jeff Nicholson is a business owner, graphic designer, songwriter, musician, author (of the foremost book on marketing with stickers), a master of creative brainstorming, and a fun, easy to work with guy to boot.